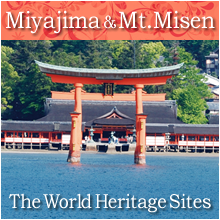 Miyajima Matsudai Kisen Tourist Ship Co., Ltd. of Hiroshima electric railway enterprise group. 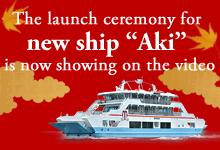 Continuous recording of the Miyajima on a large plasma TV screen! Each ferry is equipped with an automated external defibrillator (AED) for passenger's safety. Passengers taking a pet should keep it on a leash or put it in a cage. Except for seeing-eye dogs and service dogs, animals are not permitted inside the passenger cabin. The ferry platform for Miyajima has changed.